As somebody who tries to analyze, measure, and track every recorded aspect of the Tallahassee real estate market, I am often curious about the impact of the changes we are seeing in the real estate brokerage industry. 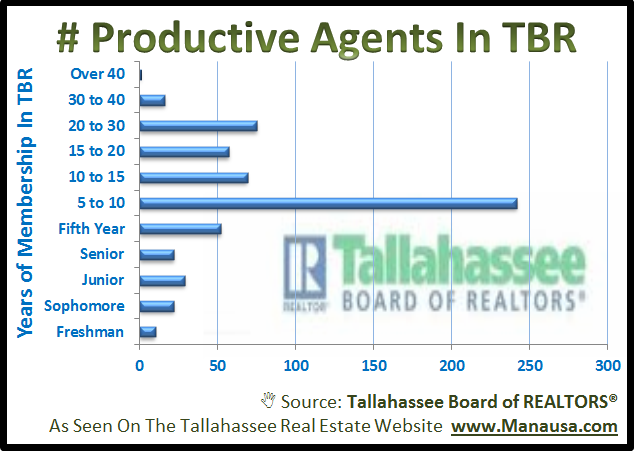 With the help of the Tallahassee Board of REALTORS® Multiple Listing Service, today I want to take a look at real estate agent productivity and compare it with the amount of years they have been with the Board (experience). Anybody who has tried to sell a home lately knows just how tough the housing market is right now. There have been more homes failing to sell over the past five years than there have been successful home sales, and this trend is likely to continue for several more years. But how much of this really boils down to Tallahassee REALTOR experience, or is there something else that is more important? And how would we go about measuring and analyzing that? By my count at the end of November 2011, there were just under 1,200 REALTORS in the Board with an "Active" status. 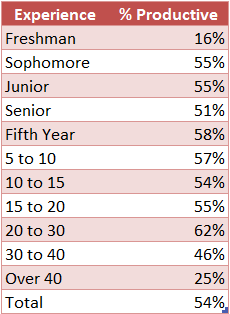 Based upon the graph above, 85% of these have less than 20 years of experience, and 65% have less than 10 years of experience. 9% have fewer than 2 years of experience. But this only tells us about the make-up of the membership, we can now look and see who is actually selling something. 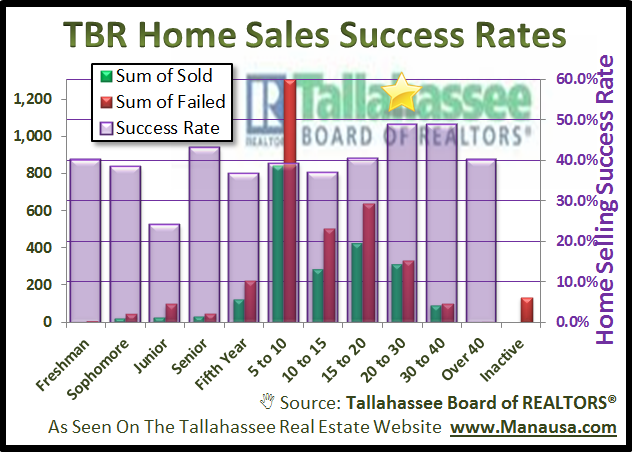 The following real estate graph shows the number of active and productive Tallahassee REALTORS who have closed a home sale in the past twelve months. At first glance, the graph above seems to parallel the one above it. When we look at the productivity levels for each experience group, we find the numbers in the table at the right. Most experience levels are seeing their "membership" at just over fifty percent productive. This could be a sign that once somebody has finished their first year in the business, they are as likely as anybody to be productive. What scares me the most is that it seems we can't stop slowing down until we get 40 years in the business :). This next graph compares the number of homes sold by each experience group with its corresponding number of homes that the group failed to sell, for the period of December 2010 Through November 2011. Remember, it won't be pretty, as fewer than 50% of the homes listed for sale last year actually sold. 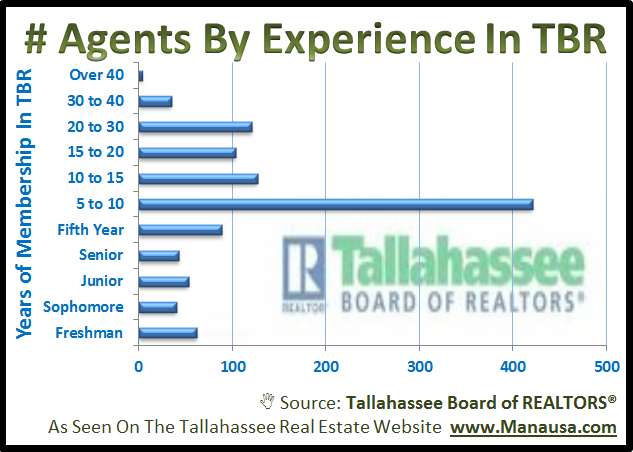 The Tallahassee REALTORS who have been in the business 20 to 30 years performed the best, with a 48.8% success rate. Putting this in the simplest terms, would you hire somebody (based solely on experience) because they sell fewer than half of the homes that they list for sale? Experience is wonderful, but you can see that there is not much difference between a first-year "freshman" REALTOR® and one with over 40 years of experience when it comes to being able to sell your home. That means you have to look beyond the presentation and ask to see a history of performance. Don't simply hire somebody that seems to know more than you about selling a home, demand to see their success rate with their plan to sell your home. It is the passion and drive that keep one going. Hardwork and opportunity keep one survive.